Heiress Melsa Manton (Stanwyck) and her Park Avenue society friends are constantly pulling pranks. This puts them at odds with the law and makes them the subject of negative stories in the press. When Melsa discovers a murder victim in a vacant building, she has a hard time convincing the police she’s telling the truth. With the help of her Park Avenue pranksters, Melsa plays detective, putting her at odds with newspaper editor Peter Ames (Henry Fonda). Peter thinks Melsa and her ilk are foolish, spoiled, rich kids with too much time on their hands. Peter’s negative articles about Melsa and her friends drive Melsa crazy. She’s desperate to be taken seriously in spite of her less-than-serious reputation. Will Melsa be able to convince Peter that she’s not a dizzy heiress and help her solve the murder? 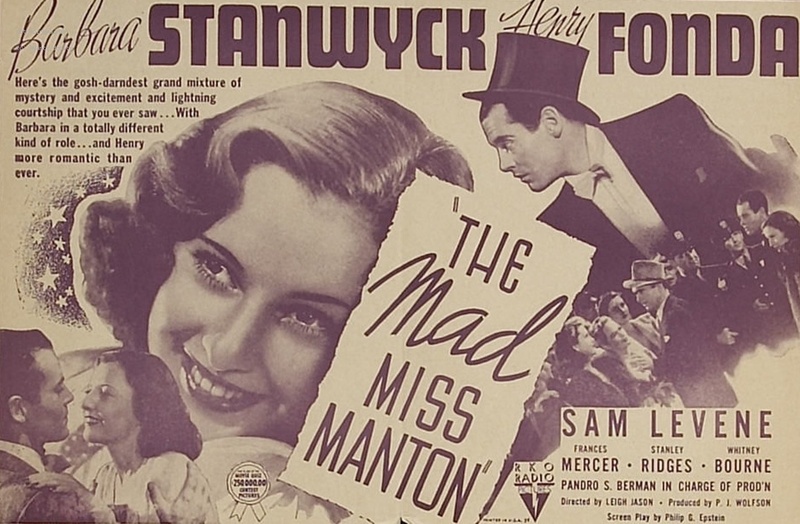 The Mad Miss Manton was the first of three pictures that starred Stanwyck and Fonda and it’s a fun screwball romp in the tradition of My Man Godfrey and The Thin Man. The Mad Miss Manton is part of the “Stanwyck on State Street” Film Series. Have some Joe and Enjoy the Show! You can bring food and beverages into the auditorium; we even have small tables set up next to some of the seats. General Admission: $5 Students and Senior Citizens: $3. Twice a month we screen classic films and have a brief discussion afterward. For more information, including how to join (it’s free), click here. The Venue 1550 is easily accessible by the CTA. Please visit Transit Chicago for more information on transportation options. Stephen Reginald is a freelance writer and editor. He has worked at various positions within the publishing industry for over 25 years. Most recently he was executive editor for McGraw-Hill’s The Learning Group Division. A long-time amateur student of film, Reginald hosts “Chicago Film Club,” a monthly movie event held in the South Loop, for the past two years. Reginald has also taught several adult education film classes at Facets Film School, Chicago.